Growing tomatoes in Texas's hot, humid climate isn't always easy. Too hot and the fruit won't set. Too much rainfall and the fruit cracks, or the plants develop diseases and lose their leaves. These problems may have been largely solved with the introduction to Texas of Solar Fire, a heat-tolerant variety developed by researchers at the University of Florida's Institute of Food and Agricultural Sciences. 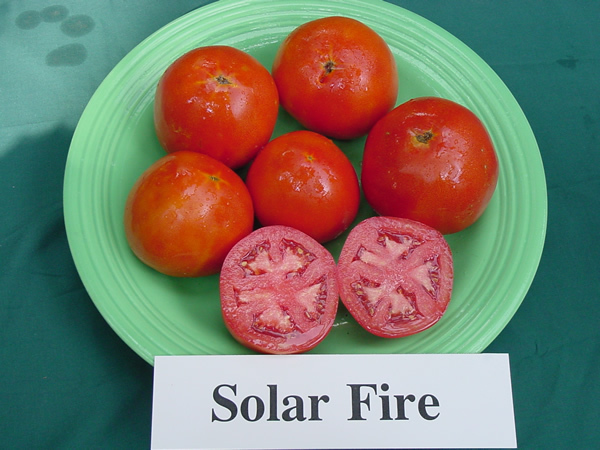 "Solar Fire is our best bet yet for a tomato that can set fruit at warm temperatures," said Jay Scott, a professor of horticultural sciences at UF's Gulf Coast Research and Education Center in Bradenton. "Most tomatoes that can set fruit at higher temperatures have small fruit, but this one is different. And you can plant this variety earlier in the fall growing season than other varieties." This means Solar Fire can be planted in July in Texas and will reliably set fruit in the heat which sometimes comes unexpectedly in September and October - such as in 2004 and 2005. Solar Fire has medium to large-sized fruit, just above 6 ounces, with an attractive red color and gloss. Each vine bears a lot of fruit, so crop yields are good. It is a firm tomato. It's best when eaten fresh in salads or sandwiches, rather than cooked or canned. Solar Fire is resistant to races 1, 2 and 3 of Fusarium wilt, as well as Verticillium wilt race 1 and gray leafspot. It has moderate resistance to fruit soft rot, a bacterium that attacks damp tomatoes after the fruit has been harvested. Heat-tolerant variety developed by the University of Florida, this one extends the tomato season for gardeners who can plant a fall crop earlier in the summer and still get fruit set despite high temperatures. Medium to large-sized fruit is produced very heavily on plants that are resistant to three races of fusarium wilt, gray leaf spot, and show tolerance to cracking. Determinate. 72 days.